"Stonewall" Jackson Genealogy page lists the descendants and ancestors of the famous Virginian and Civil War General Stonewall Jackson, and includes from burial date to cemetery location. This page also offers from free helpful advice free to free online tools for researching genealogy online, as well as sites for creating your personal family tree. A genealogy history and heritage online site. Note: Jackson's ancestors lived in areas that are now part of West Virginia, once part of Virginia. The modern designation (WV) is used in the following genealogy. West Virginia did not become a separate state until 1863.
i. GEORGE JACKSON, b. 09 January 1757, Cecil Co., MD; d. 17 May 1831, Zanesville, Muskingum Co., OH; m. (1) ELIZABETH BRAKE, 13 November 1776; b. 22 February 1757, prob. Frederick Co., VA; d. 22 March 1812, Muskingum Co., OH; m. (2) MRS. NANCY RICHARDSON ADAMS, 06 November 1814, Muskingum Co., OH; b. 18 April 1780; d. 11 October 1841. 2. ii. COL. EDWARD JACKSON, (Stonewall Jackson's grandfather) b. 01 March 1759, Near Moorefield, Hampshire (now Hardy) Co., WV; d. 25 December 1828, Jackson's Mill, Lewis Co.,WV. iii. JOHN JACKSON, JR., b. 1760, prob. Moorefield, Hampshire (now Hardy) Co., WV; d. May 1821, On route from New Orleans; m. (1) REBECCA HADDAN, 10 April 1786; d. Bef. July 1797; m. (2) ELIZABETH COZAD, 02 July 1797; b. 1779; d. 1845.
iv. ELIZABETH JACKSON, b. Bet. 1762 - 1767, Howard's Lick, Hampshire (now Hardy) Co., WV; d. Abt. 1862, Green Co., OH; m. ABRAHAM BRAKE; b. Abt. 1763, Hampshire (now Hardy) Co., WV; d. 20 August 1842, Harrison Co., West Virginia. v. SOPHIA JACKSON, b. 11 September 1763, Howard's Lick, Hampshire (now Hardy) Co., WV; d. 10 March 1836, Lewis (now Upshur) Co., WV; m. JOSIAH DAVIS, Abt. 1784; b. 09 May 1767; d. 08 October 1832.
vi. MARY SARAH JACKSON, b. 1768, Howard's Lick, Hampshire (now Hardy) Co., WV; d. Abt. 1791; m. PHILIP REGER; b. 1767, Hampshire (now Hardy) Co., WV; d. 16 July 1846.
vii. SAMUEL JACKSON, b. 10 December 1772, Howard's Lick, Hampshire (now Hardy) Co., WV; d. 1842, Terre Haute, IN; m. BARBARY REGER; b. 10 December 1775, Hampshire (now Hardy) Co., WV; d. 28 October 1838, Terre Haute, IN. viii. HENRY JACKSON, b. 10 July 1774, Upshur Co., WV; d. 24 February 1852, Upshur Co., WV; m. (1) MARY ELIZABETH HYRE, 20 May 1800; d. Bef. 1836; m. (2) ELIZABETH SHREVE, 24 April 1836; b. 10 December 1813; d. 11 April 1887. 2. COL. EDWARD JACKSON (Stonewall Jackson's grandfather) was born 01 March 1759 in Near Moorefield, Hampshire (now Hardy) Co., WV, and died 25 December 1828 in Jackson's Mill, Lewis Co.,WV. He married (1) MARY HADDAN (Stonewall Jackson's grandmother) 13 October 1783. She was born 15 May 1764 in possibly New Jersey, and died 17 April 1796 in Near Buckhannon, WVA. He married (2) ELIZABETH WEATHERHOLT BRAKE 13 October 1799. She was born 11 January 1778 in prob. Hardy Co., WV, and died 19 August 1835 in Jackson's Mill, Lewis Co.,WV. 3. i. GEORGE EDWARD JACKSON, b. 23 December 1786, prob. nr. Buckhannon, WV; d. 26 March 1831, St. Genevieve Co., MO. 4. ii. DAVID EDWARD JACKSON, b. 30 October 1788, Buckhannon, Upshur Co., WV; d. 24 December 1837, Paris, TN. 5. iii. JONATHAN JACKSON, (Stonewall Jackson's father) b. 25 September 1790, Randolph County, WV; d. 26 March 1826, Clarksburg, Harrison Co., WV. 6. iv. RACHEL JACKSON, b. 08 July 1792, Randolph (now Upshur) Co., WV; d. 28 November 1835, Lewis (now Upshur) Co., WV. 7. v. MARY HADDAN "POLLY" JACKSON, b. 19 February 1794, prob. Harrison (now Upshur) Co., WV; d. 30 August 1840, Lewis (now Upshur) Co., WV. 8. vi. REBECCA JACKSON, b. 15 September 1795, Harrison Co., West Virginia; d. 18 July 1889. 9. vii. CATHERINE "KATY" JACKSON, b. 25 July 1800, Harrison Co., West Virginia; d. 03 December 1876, Lewis Co., WV. 10. viii. CUMMINS EDWARD JACKSON, b. 25 July 1802, prob. Harrison (now Upshur) Co., WV; d. 03 December 1849, Shasta Co., CA. 11. ix. JAMES MADISON JACKSON, b. 03 April 1805, Jackson's Mill, Lewis Co.,WV; d. 27 October 1872, West Fork, Lewis Co., WV. 12. x. ELIZABETH "ELIZA" JACKSON, b. 06 April 1807, Harrison Co. (now Lewis Co.), WV; d. 22 February 1849, Mt. Vernon, Marshall Co., IN. 13. xi. JOHN E. JACKSON, b. 22 January 1810, Jackson's Mill, Lewis Co.,WV; d. Unknown. 14. xii. MARGARET "PEGGY" JACKSON, b. 02 February 1812; d. Abt. 1841, prob. Jackson's Mill, WV. xiii. RETURN MIEGS JACKSON, b. 15 May 1814, prob. Jackson's Mill, Lewis Co., WV; d. July 1835, Nr. St. Genevieve, MO. xiv. EDWARD J. JACKSON, b. 29 October 1817, prob. Jackson's Mill, Lewis Co., WV; d. 1848, Jackson's Mill, Lewis Co.,WV. 15. xv. ANDREW M. JACKSON, b. 16 March 1821; d. 31 August 1867, Hughes River, Ritchie Co., WV. 3. GEORGE EDWARD JACKSON, was born 23 December 1786 in prob. nr. Buckhannon, WV, and died 26 March 1831 in St. Genevieve Co., MO. He married CATHERINE MCCLANAHAN before 1817. She died 26 January 1837 in Lawrence, St. Genevieve CO., MO. i. HELEN MCGIGEORY OR MCGREGOR JACKSON, b. 26 October 1817, St. Genevieve, Co., MO; d. 03 March 1913, Farmington, MO. ii. EDWARD G. JACKSON, b. 15 September 1819.
iii. LYDIA ANN JACKSON, b. Abt. 1822.
iv. MARY VIRGINIA JACKSON, b. Abt. 1830. 4. DAVID EDWARD JACKSON was born 30 October 1788 in Buckhannon, Upshur Co., WV, and died 24 December 1837 in Paris, TN. He married JULIET T. NORRIS 02 November 1809. She was born 22 December 1783 in Fauquier Co. VA, and died 16 March 1865 in Lewis Co., WV. i. EDWARD JOHN JACKSON, b. 31 July 1810; d. 08 December 1896.
ii. WILLIAM PITT JACKSON, b. 05 January 1812; d. 30 March 1837.
iii. NANCY NORRIS (TWIN) JACKSON, b. 12 October 1815; d. 1891; m. MINOR CARR HALL, 28 October 1855; b. 03 December 1815; d. 19 May 1885.
iv. MARY JONES (TWIN) JACKSON, b. 12 October 1815; d. 11 July 1900; m. JOHN HENDERSON HAYS. 5. JONATHAN JACKSON (Stonewall Jackson's father) was born 25 September 1790 in Randolph County, WV, and died 26 March 1826 in Clarksburg, Harrison Co., WV. He married JULIA BECKWITH NEALE (Stonewall Jackson's mother) 28 September 1817. She was born 28 February 1798 near Aldie, Loudoun Co., VA, and died 03 December 1831 in Fayette Co., West Virginia. Julia Beckwith Neale was the daughter of Thomas Neale and Margaret Winn. Four years after the death Jonathan Jackson, she married Blake Baker Woodson (b. 1783 d. 1833 m. 1830). Julia and Blake had one child, William Wirt Woodson (known as Wirt; b. 1831 d. 1875), who was Stonewall Jackson's half-brother.) Julia died less than 2 months after giving birth to Wirt. i. ELIZABETH JACKSON, b. 1819, prob. Clarksburg, Harrison Co., West Virginia; d. 05 March 1826, Harrison Co., West Virginia. ii. WARREN J. JACKSON, b. January 1821, prob. Clarksburg, Harrison Co., West Virginia; d. November 1841, Turkey Run, Upshur Co., West Virginia. Burial: Brake/Jackson Cemetery, Turkey Run, Upshur Co. WV. Cause of Death: tuberculosis. Unmarried, no issue. iii. THOMAS JONATHAN (Stonewall) JACKSON, b. 21 January 1824, Clarksburg, West Virginia; d. 10 May 1863, Near Guiney's Station, Virginia. iv. LAURA ANN JACKSON, b. 27 March 1826, prob. Clarksburg, Harrison Co., West Virginia; d. 24 September 1911, Buckhannon, Upshur Co., WV. 6. RACHEL JACKSON was born 08 July 1792 in Randolph (now Upshur) Co., WV, and died 28 November 1835 in Lewis (now Upshur) Co., WV. She married JACOB B. BRAKE 10 September 1815. He was born 01 August 1785 in prob. Hardy Co., WV, and died 10 July 1869 in Upshur Co., WV. i. EDWARD HADDEN BRAKE, b. 11 August 1816.
ii. LEONARD J. BRAKE, b. 08 December 1817.
iii. MARY BRAKE, b. 17 December 1819.
iv. GEORGE WASHINGTON BRAKE, b. 13 March 1822.
v. RACHEL BRAKE, b. 26 March 1824.
vi. JACOB LORENZO DOW BRAKE, b. 25 July 1826.
vii. CATHERINE ELIZABETH BRAKE, b. 18 May 1828.
viii. REBECCA BRAKE, b. 16 May 1829.
ix. DAVID J. BRAKE, b. 21 February 1832.
x. ELIZA BRAKE, b. 24 May 1834. 7. MARY HADDAN "POLLY" JACKSON was born 19 February 1794 prob. in Harrison (now Upshur) Co., WV, and died 30 August 1840 in Lewis (now Upshur) Co., WV. She married ISAAC BRAKE 30 November 1820. He was born about 15 November 1797 in prob. Hardy Co., WV, and died 17 January 1885 in Near Buckhannon, WVA. i. RACHEL ELIZABETH BRAKE, b. 04 January 1822.
ii. EDWARD STALNAKER BRAKE, b. 20 February 1823.
iii. JACOB BRAKE, b. 10 October 1824.
iv. MELVILLE SHOOK BRAKE, b. 05 August 1826.
v. DIADEMA BRAKE, b. 20 July 1828.
vi. OLIVE BRAKE, b. 07 September 1830.
vii. MARY VIRGINIA BRAKE, b. 05 October 1837.
viii. ISAAC NEWTON BRAKE, b. 30 August 1840. 8. REBECCA JACKSON was born 15 September 1795 in Harrison Co., West Virginia, and died 18 July 1889. She married GEORGE BEAVER WHITE 19 December 1811. He was born 13 October 1788 in prob. Sussex Co. , NJ, and died 01 October 1858 in Wood Co., WV. i. EDWARD WHITE, b. 23 August 1812.
ii. PRUDENCE WHITE, b. 22 October 1814.
iii. CUMMINGS JACKSON WHITE, b. 02 January 1818.
iv. MARY CATHERINE WHITE, b. 11 April 1819.
v. ISABELLE WHITE, b. 24 February 1822.
vi. RACHEL WHITE, b. 01 September 1824.
vii. ELIZA CERENA WHITE, b. 23 January 1827.
viii. ALEXANDER WHITE, b. 12 November 1829.
ix. OLIVE WHITE, b. 22 March 1835.
x. DAVID JACKSON WHITE, b. 16 May 1832.
xi. THOMAS BENTON WHITE, b. 01 September 1838.
xii. GEORGE WHITE, b. Abt. 1842.
xiii. AURILLA WHITE, b. Abt. 1845. 9. CATHERINE "KATY" JACKSON was born 25 July 1800 in Harrison Co., West Virginia, and died 03 December 1876 in Lewis Co., WV. She married JOHN WHITE 25 April 1824. He was born 02 May 1794 in Hardy Co., WV, and died 30 April 1875 in Lewis Co., WV. i. FORTUNATUS WHITE, b. 02 November 1824.
ii. SYLVANUS WHITE, b. 15 January 1827.
iii. MARCELLUS WHITE, b. 17 March 1829.
iv. GEORGE EDWARD WHITE, b. 17 August 1831.
v. MARELLA KATHERINE WHITE, b. 01 February 1834.
vi. WILLIAM PITT WHITE, b. 15 August 1836.
vii. ALEXANDER PERRY WHITE, b. 13 October 1838.
viii. JOHN MCDOWELL WHITE, b. 18 February 1841.
ix. CUMMINS WHITE, b. 1844. 10. CUMMINS EDWARD JACKSON was born 25 July 1802 in prob. Harrison (now Upshur) Co., WV, and died 03 December 1849 in Shasta Co., CA. i. CUMMINS NORRIS JACKSON, b. Abt. 1847. 11. JAMES MADISON JACKSON was born 03 April 1805 in Jackson's Mill, Lewis Co.,WV, and died 27 October 1872 in West Fork, Lewis Co., WV. He married EMMA ELEANOR LAW 04 December 1836. She was born 11 November 1806 in Lewis Co., WV, and died 17 December 1850 in Lewis Co., WV. ii. STOKELY RUSMISEL JACKSON, b. 08 January 1839.
iii. MARGARET EUPHEMIA JACKSON, b. 03 September 1841.
iv. NANCY ELIZABETH JACKSON, b. 15 July 1843.
v. MARY ELEANOR JACKSON, b. 21 September 1845.
vi. EDWARD THOMAS JACKSON, b. 03 August 1848. 12. ELIZABETH "ELIZA" JACKSON was born 06 April 1807 in Harrison Co. (now Lewis Co.), WV, and died 22 February 1849 in Mt. Vernon, Marshall Co., IN. She married NICHOLAS L. CARPENTER July 1829. He was born 1803, and died 05 February 1872 in Green Township, Marshall Co., IN. i. DAVID M. CARPENTER, b. 06 May 1830.
ii. EDWARD JACKSON CARPENTER, b. 25 November 1831.
iii. CAROLINE CARPENTER, b. 24 October 1833.
iv. JOHN CARPENTER, b. 1836.
v. ALBERT H. CARPENTER, b. 15 September 1838.
vi. ELIZABETH "ELIZA" CARPENTER, b. 15 March 1841.
vii. MARY E. CARPENTER, b. 11 October 1843.
viii. RACHEL CARPENTER, b. January 1849. 13. JOHN E. JACKSON was born 22 January 1810 in Jackson's Mill, Lewis Co.,WV, and died Unknown. He married MARY SARAH BURNS 11 October 1836. 14. MARGARET "PEGGY" JACKSON was born 02 February 1812, and died Abt. 1841 in prob. Jackson's Mill, WV. She married JONATHAN THOMPSON HALL 07 March 1833. He was born 04 December 1810 in prob. Harrison CO., WV, and died 1845.
i. JULIA ANN HALL, b. 01 August 1834.
ii. WILLIAM DEXTER HALL, b. 27 September 1836.
iii. MARY E. HALL, b. 1839.
iv. EDWARD H. HALL, b. 13 May 1841. 15. ANDREW M. JACKSON was born 16 March 1821, and died 31 August 1867 in Hughes River, Ritchie Co., WV. He married MARY DEEM 23 March 1843. She was born 01 June 1821 in Green Co., IN, and died 30 January 1879 in prob. Owen Co., IN. i. MARGARET ISABELLA JACKSON, b. Abt. 1847.
ii. ELIZABETH CATHERINE "KATE" JACKSON, b. 30 October 1849.
iii. SUSAN MARIA JACKSON, b. 25 July 1856.
iv. MARTHA ELIZABETH (TWIN) JACKSON, b. 22 July 1861.
v. MARY REBECCA (TWIN) JACKSON, b. 22 July 1861. Recommended Reading: Genealogy 101: How to Trace Your Family's History and Heritage. Description: A recent Maritz Poll reported that 60% of Americans are interested in their family history. And with good reason. Through genealogy, you can go back into history to meet people who have had more influence on your life than any others -- your ancestors. And the better you get to know your ancestors, the better you will get to know yourself: the who's and what's and why's of you. Continued below. Barbara Renick, a nationally-known lecturer on genealogy, tells the uninitiated researcher the steps needed to find out who their ancestors really were, and brings together for even the more experienced genealogical researchers the important principles and practices. She covers such topics as the importance of staying organized and how to go about it; where and how to look for information in libraries, historical societies, and on the internet; recognizing that just because something is in print doesn't mean it's right; and how to prepare to visit the home where your ancestors lived. Genealogy 101 is the first book to read when you want to discover who your ancestors were, where they lived, and what they did. Recommended Reading: Beloved Bride: The Letters of Stonewall Jackson to His Wife. Description: He called her "my beloved esposa" because Anna was his dearest love on this earth. The great military exploits of General Stonewall Jackson are studied in military schools around the globe, and his iron will and stern self-discipline have become legendary. However, little has been said about his remarkable marriage. 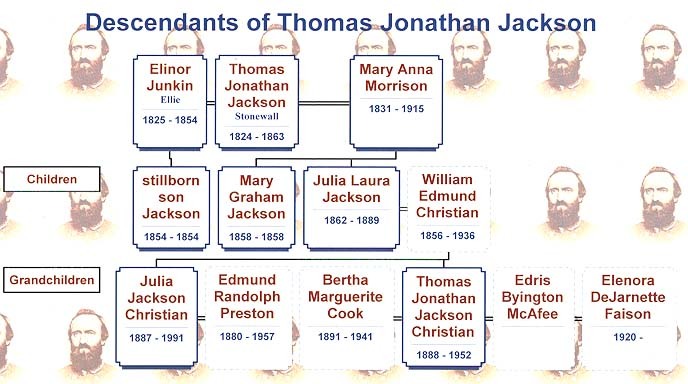 The real Thomas J. Jackson was a humble Christian and loving husband and father. Continued below. The tender and instructive letters he wrote to his wife Anna are a model of godly leadership and covenantal faithfulness. From their courtship to their final days together, trace the true story of this remarkable couple through the letters of General Jackson to his bride. Even in the midst of the most arduous military campaigns, Stonewall took the time to send home extensive letters of love and devotion. Through all of this, General Jackson proves himself to be a model example for Christian husbands of the twenty-first century -- especially through his dedication to living for God's glory and trusting in His providential care. This special edition book features a foreword by Stephen Lang, the actor who portrays "Stonewall" Jackson in the film, Gods and Generals. Recommended Reading: The Complete Idiot's Guide to Genealogy, 2nd Edition. Description: A very helpful genealogy reference! It is extremely helpful if you're in the "I want to trace my roots, ancestors, family tree and heritage. How do I begin, where do I start, and how do I go about doing it?" situation. It contains numerous helpful common sense tips that will prevent future headaches and a lot of well thought out suggestions and tips too. One helpful hint: "Talk with your extended family and interview them for genealogy information, be patient with them, and let them tell their stories....document everything." Continued below. There are plenty of well-mannered tips like these that elevate this book to excellence. A lot of the confusing aspects of genealogical research such as document requests and providing proof and evidence are well covered. RATED 5 STARS. Customer's Review: I bought this book when I hadn't yet done any research at all about my family history. A year and a half later, I have a file drawer full of information, and I have needed no other reference. I also bought a book called "The Source", which is supposed to be the 'genealogist's bible', and it has been a giant paperweight in comparison. Idiot's genealogy is full of the kind of practical information that can carry you through years of research. Happy hunting!! !